Chics Peppy Dual is by $3 Million sire Mister Dual Pep and out of a daughter of $11 Million sire Smart Chic Olena (who is one of two stallions to have sired $1 Million in the NRHA, NCHA and NRCHA). She is a granddaughter of AQHA Hall of Fame and $25 Million sire Peppy San Badger. She was bred and raised by the legendary Babcock Ranch who stood horses such as Smart Chic Olena, Reminic, Mister Dual Pep and Trashadeous. She is a trained reining horse, but has not been shown in NRHA competition. She is easy to handle, ride and is the same if ridden once a week or once a year. To learn more about her lineage, click the red names. 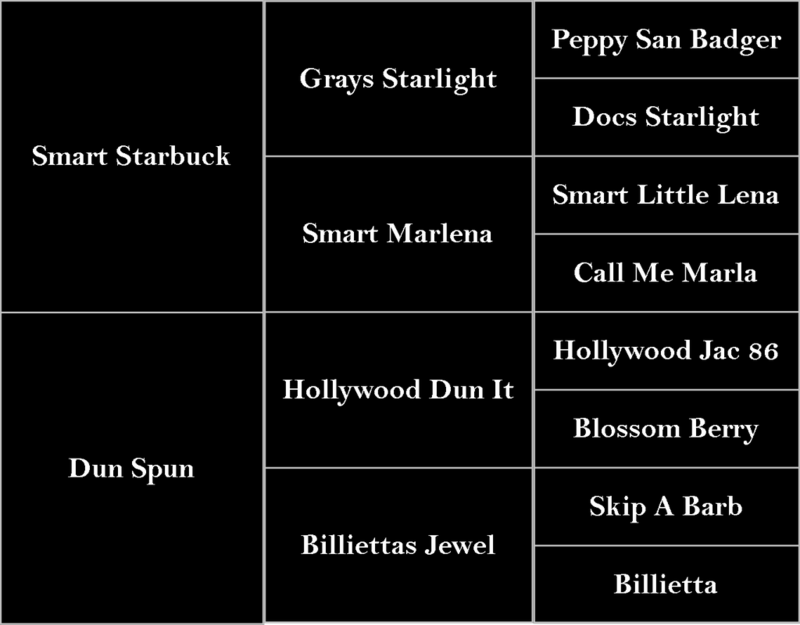 Smartly Spun is by NRHA $1.8 Million sire Smart Starbuck and out of a daughter of NRHA $6 Million sire Hollywood Dun It. Smart Starbuck earned $60,045 in NRHA competition. She is a granddaughter of $10 Million Dollar sire Grays Starlight who is one of two stallions to have sired $1 Million in the NRHA, NCHA and NRCHA. She is a granddaughter of the legendary Hollywood Dun It, NRHA $6 Million Dollar Sire. Smartly Spun is a trained reining horse that has been shown in Green Reiner and used at home by riders of all levels. 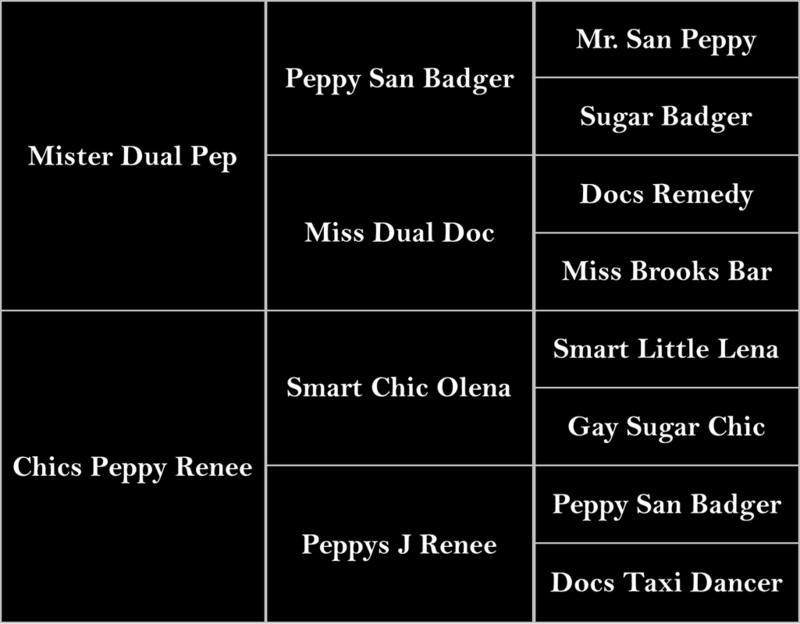 To learn more about her lineage, click the red names. Vintage Merlot is by NRHA $1.3 Million sire A Sparkling Vintage and out of a daughter of $11 Million sire Smart Chic Olena (who is one of two stallions to have sired $1 Million in the NRHA, NCHA and NRCHA). A Sparkling Vintage is the #1 producing son of of the legendary Shining Spark and the ONLY Million Dollar Sire by Shinning Spark. A Sparkling Vintage is one of three sires in history to sire an NRHA Triple Crown winner (Not Ruf At All). A Sparkling Vintage earned $82,516 in NRHA competition; placing 3rd in the NRHA Futurity. She is an all around horse that can be ridden by riders of any level. To learn more about her lineage, click the red names. Sweet Gal Pep sired by Equi-Stat $1 Million Sire Skeets Peppy. Skeets Peppy is one of the few horses that has made the finals of both the NRHA Futurity Open and the NRCHA Snaffle Bit Futurity Open. He was the 1999 NRHA Open Reserve World Champion on his way to earning $85,306. Sweet Gal Pep is out of a daughter of Dunit Rawhide (NRHA: $78,700). Dunit Rawhide was the 1995 NRHA Futurity Limited Open Champion and placed third in the open. He is a son of the legendary Hollywood Dun It, NRHA $6 Million Dollar Sire.